Proper documentation will get aircraft parts more easily approved by the U.S. Dept. of State to pass through U.S. Customs without delay. Operators are sometimes unaware that parts or units listed on the United States Munitions List (military items) must meet specific requirements to be shipped to the U.S. Without proper authorization, shipments can be delayed at the border for months. Here’s what you need to know to avoid delays. The United States Government has International Traffic in Arms Regulations (ITAR) pertaining to the import and export of parts or units on the United States Munitions List. ITAR items shipped to theU.S.are not allowed into the country unless the company or person shipping the item (shipper) has registered with the U.S. Department of State (DOS) and has obtained an import license, or that the shipment qualifies for a license exemption. If items are shipped to the U.S.without this prior-authorization, they maybe held at the border for up to 60 days while the DOS decides whether to approve their admittance into the U.S.
To prevent days and weeks of delays, I highly recommend you notify your U.S.aircraft parts service provider prior to shipping any aircraft parts for repairs or exchange cores. They should be able to identify if the part is ITAR controlled and provide the proper language required for the commercial shipping invoice. If your chosen aviation parts service provider is not knowledgeable of U.S. ITAR, is not capable of pre-clearing your shipment or is not able to provide the necessary language and paperwork for your shipment to enter the U.S., stop and find one that is. Duncan Aviation screens all incoming shipments for ITAR-controlled items and provides our broker with the proper information for U.S. Customs so the parts are easily approved by the DOS and pass through U.S. Customs without delay. We monitor all shipments as they go through this process and will swiftly deal with any delays in a timely manor. 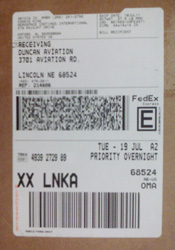 To ship parts to Duncan Aviation, please complete a shipping notice form. Duncan Aviation provides extensive repair and overhaul services—including loaners and exchanges—for business aircraft parts, avionics, instruments, accessories and propellers. We maintain a large inventory of aircraft parts for sale. We also hold more than 70 manufacturer authorizations for avionics, instruments, accessories and propeller units. Don Heinlein serves as the Domestic & International Parts Team Leader at Duncan Aviation, specializing in parts requests. He began working in aviation in 1977.